Experts cleaning a supposed imitation of a Botticelli painting have discovered it was actually created in the Renaissance master's own studio. Extensive tests showed it did in fact originate from Botticelli's 15th Century workshop in Florence. English Heritage said it had consulted experts at the Victoria and Albert Museum and the National Gallery to confirm the painting's origins. Rachel Turnbull, English Heritage's senior collections conservator, said: "Stylistically it was too similar to be an imitation, it was of the right period, it was technically correct and it was painted on poplar, a material commonly used at the time. "After removing the yellowing varnish, X-ray and infrared examination revealed under-drawing, including changes to the final composition uncommon in straight imitations." "Botticelli, like other contemporary Florentine painters, had an active studio which issued versions and adaptations, presumably at lower prices, of works that were popular," according to Professor Paul Joannides, emeritus professor of art history at the University of Cambridge. "It is only relatively recently, with more highly developed methods of technical examination, that the status of such pictures can be - at least to an extent - determined." 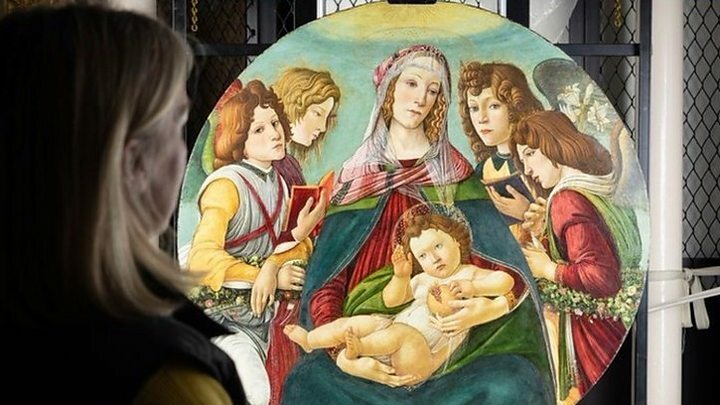 The picture at English Heritage's Ranger's House in Greenwich, London, is now thought to be the closest version of Botticelli's 1487 masterpiece, which shows a melancholy Virgin Mary holding a baby Christ and a pomegranate, flanked by angels. Madonna of the Pomegranate will be on display at Ranger's House from 1 April. How can you spot a real Botticelli?